6 surge protector AC outlets offer complete protection with LED indicator light, protect your devices from damage of electronic shock. The surge protector was wall mount designed, allowing you to plug it into any AC outlet, saving space on floors and countertops. 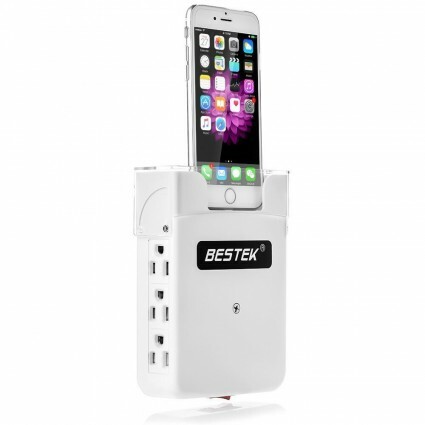 It can fit for North American standard AC power outlet, no more cable chaos, convenient to take and use. Additional 4 powered USB ports with 6 AC outlets can meet your multiple charging requirements simultaneously without blocking each other, eliminating the need for wall adapters. Dual 2.4A ports for fast charging of iPads and tablets. 2 charging docks were specially designed with 2 cellphone adapters for cellphone charging, especially for your iPhone (iPhone7, 7 Plus, 6S, 6 Plus, 5S, 5C, 5) and Android phones. Lighted on/off switch was designed with integrated circuit breaker for overload protection of all all outlets and USB ports. Made of heavy duty fire-resistant material and high quality, the charger can be well protected from short circuit. • Please remove your cell phone covers/cases prior using the adapters for proper fitting. • The USB ports are intended only for charging devices, not for data transmitting or used as a USB hub. • The 2 cellphone adapters for iPhone and Android are included in the package. Please check your parcel carefully in case of losing them.